Neues im SV-Heft? Fehlanzeige! 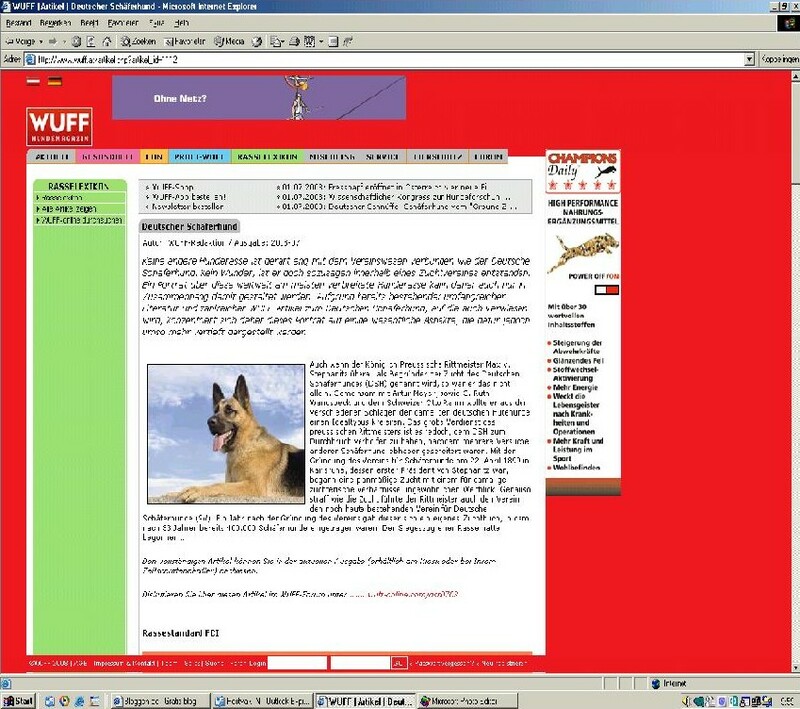 Aber im WUFF-Magazin 07/2008!! Ich darf heute hinweisen auf einen interessanten Artikel im WUFF-Magazin! Nein, ich bin nicht beteiligt an dem Magazin! Aber, wenn der SV, wie ich immer in meine Studien schreibe, gar nichts schreibt und gar nichts bewegt, müssen es andere tun. The Bottleneck of the Century - Only one blood line left! In my last study we have seen a great overview of the most successful current stud dogs of the last years (successful: “money-wise”). Now wouldn’t it be nice if we could pursue their individual blood lines and look back at their complete genealogy table. One would think that we would then be able to go for a wonderful and varied sightseeing tour through the whole vast blood base of the German Shepherd Breed, a wide blood base which the breed wardens of the Kennel Club apparently enjoy placing on their list as the paramount priority, not in the least at the occasion of the main breeding show: the Siegerschau, and a wide blood base which is always formally promoted out loud in all publications of the SV. And while we are dealing with the "crème de la crème" of German Shepherd breeders here, one would mean to encounter their canine knowledge, their diversity and their flexibility. By no means do I intend to beat you to it, but it will become a gigantic disappointment. Evaluating this study at first, I thought it would become a hell of a job. So many dogs, in each individual case with father's line and mother's line. Could this be mastered? I had to find out quite quickly that it would in fact become a mere children's play. A very easy case of “copy and paste”. It was crystal clear from the very beginning that at the end of the chain one must always end with Horand von Grafrath. That much I knew, and so do you. It came as a complete surprise however, that already after extremely few generations, one would end up over and over again with the same dogs, and, therefore, a further pursuit of the lines was unnecessary, because in fact there is only one single bloodline left. A line which by the way is very well known to everyone. I had not anticipated this! The offspring of the most frequently used stud dogs without a doubt determine the breed and its future. If this study documents one thing, then it would be that the future by no means looks "broad", and we would rather have to speak of a continuing contraction, a narrowing which began with Xaver von Arminius and Palme vom Wildsteiger Land. When one tries to bring ones message across clearly, one must present it expressively.Ich hoffe, ich werde das schaffen. I hope I will be able to do just that. The enclosed table is convincing enough in its persuasive power. You will notice that the chart features 130 selected stud dogs, all of them have been presented in my last study: „The Stud Business in the SV - 2003-2007”, as they performed the biggest number of jumps in this given period. Dogs with less than 10 stud jobs were removed. Some young dogs which have already been used frequently during the last two years and which are becoming successful and important stud dogs for the future, were also added. Together, these dogs are responsible for the most important pool of German Shepherds, and their offspring will not only take the first places during the next exhibitions but will also continue the same blood lines we have always had, in the near future. The table was made on the basis of the data provided by the stud news of the SV which documents unmistakably the many activities of the leading stud dogs during the last years. Note: During the Siegerschau many dogs with interesting and divergent genealogy tables may indeed be presented and they would therefore simulate a wide blood base, yet they do not have any impact whatsoever on the breed. They are not being used in the breeding or only barely. Who does have an influence on the race, are the top-stud dogs which were introduced most recently in my study. They don’t solely multiply the qualities of their predecessors, but also strengthen, or even particularly strengthen the deficits. It was indeed a long row of great dogs which I had introduced. It promised to be a great load of work to study the genealogy table of so many dogs. Funny enough my exploratory expedition to the roots of these dogs was determined by frightening boredom and dull uniformity, void of imagination. But do have a look for yourself! Now please take a look again and study the attached table. You must be just as surprised as I was at the fact that there is actually only one single decisive blood line left. Even today this very line dominates the whole stud business of the top dogs in the Hochzucht. The blood line starts with the forefathers of Xaver von Arminius and Palme vom Wildsteiger Land. Do go ahead and study the genealogy table of this couple. Now this is how almost all genealogy tables in the Hochzucht look like today. They are all the same! And the dogs as well are very much... the same, uniform, too big and too heavy and of the same colour... exemplarily. They are all copies of one another. Kommissar Rex*, the new Rin Tin Tin, sends his regards! Most of them also do not correspond anymore to the breed standard, but when they are all too big, it doesn’t catch one’s eye anymore. So after approximately 30 generations of German Shepherds, one does not need a gigantic, and many square meters wide board on the wall to document the many trunks of the tree. A Din-A4 sized sheet of paper suffices to show the genealogy table of almost all German Shepherds of the modern times in a clear fashion. In connection to this it is with pleasure I still remember my first studies of the blood lines plans which were produced and sold by the friendly Mrs. Roswitha Buck. I had spread them out on the floor, they filled the entire free surface of the sitting room. Today one can offer the GSD-fans all of the "essentials" on one single sheet. And although it is all very “clearly arranged”, it is exactly what we do NOT want. An accumulation of the same blood, but along with the qualities, also many many deficits. Now one does not have to listen to the author of this report, I have proved nothing in the breeding and bring no breeding experience. But when the top of the Kennel Club does not even listen to some of their best representatives, we have a huge problem indeed. Yes! Why does nobody listen then? Each and every new year again, the breed wardens select the same lines, and at a guess, not in the least based on their long-standing "friendships", they look for yet another representative of the same blood line. So much for the canine knowledge and experience of the best breeder of shepherds in the world “vom Kirschental”. Unfortunately, their cries also fade away into the darkness. So many experiences and so much knowledge was collected by confirmed experts, and their findings were made available in written form by means of the Internet, not only to the laymen, but also to the people in charge at the Kennel Club, but it is not reflected in suggestions for improvement by the functionaries of the SV and its respective breed wardens. I will refrain from translating the quotations offered in the German version of this paper. Should you wish to read more about the most interesting findings of the different authors of these papers, something which I can only recommend firmly, please visit the link above or you can take the quotations and feed them to an online translating machine, just to give you a rough idea of the criticism. The important statements we can all read on the mentioned website unfortunately did not draw the attention of the SV. I leave it up to my readers to make their own conclusions. Please go to the above mentioned link, and read the entire comments of these experts. These statements have one thing in common. They were all coming from absolute experts in the area of the Shepherd Dog breeding, with decades of experience by the way, and they have indicated serious problems. Unfortunately, they also have in common that neither presidents nor breed wardens seem to be interested in the presented facts. It didn’t help a thing. Since decades the SV is directed by the very few. There is no democratic way of listening to the problems whatsoever. The respective committees have turned out to be incompetent, otherwise countless changes would have been applied as well as suggestions been documented in the breeding regulations. But no sign of that! One has learned nothing in spite of many warnings, one has neither accepted the criticism nor at least studied the findings, and the German Shepherd became a mockery and what Captain von Stephanitz feared the most: it developed into a "Nurluxushund", a luxury dog only. Now I would wish that one of the big canine experts (breed wardens) would explain to me, what was so very extraordinary about the Q-litter from von Arminius (beside the fact that the litter sprouted from the loins of Xaver von Arminius, owned by Mr. Herman Martin - in an "additional occupation" he was President of the Kennel Club – and that it was born in the kennel of his friend Martin Göbl – vom Wildsteiger Land). What was so extraordinary that immediately the whole breed had to be based on it! In connection with Palme vom Wildsteiger Land, not only good qualities have intruded, but particularly the Canine Hip Dysplasia. Both of her parents could not prove perfect hips..., but that is another story altogether. I might elaborate on that sometime later. The Q-litter of von Arminius with Sieger Quando produced the legendary Odin von Tannenmeise (bred in Holland). 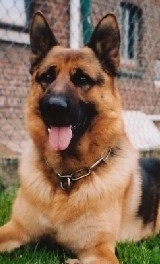 The inline-breeding has accumulated and very closely to, through the Q-litter from von Arminius/Uran Wildsteigerland (Palme), Odin Tannenmeise and Cello Römerau (Quana A). Later the Palme-Uran-Quando-Odin and Cello-line brought us: Ulk von Arlett, Ursus von Batu, and Yasko vom Farbenspiel. Now how wide is it, this vast blood basis of our breed? I cannot see it. If up until today you believed in a wide blood base for our breed, I am very sorry if I have destroyed your illusions. Do enlighten me if you still believe that there is a healthy future for the breed. I have lost all of my hopes, because there is a complete lack of canine competence at the head of the Kennel Club and the functionaries show a complete lack of personal strength and guts, strength and guts which are elementary for an office as a Bundeszuchtwart for instance. If one keeps concentrating furthermore on very few blood lines in the Hochzucht, the health of the whole race will be ruined and go down the drain. Some have already said their goodbyes and left the building. I do hope these people will take care of the healthy preservation of at least some trunks of the genealogy tree of the German Shepherd. Then they will be worthy breeders of German Shepherd Dogs with working abilities, in the footprints of Captain Max von Stephanitz. What a joy it was, when at the very end of the list, after all uniformity and against all odds, one would be allowed to complete a genealogy table, void of all Hochzucht-duplicates. One single dog could be taken up into the list of popular stud dogs with a completely different family tree: Aiax vom Röhnsaler Bach. Now here, I could not just "copy/paste". The names of the forefathers were (although of course well-known) as "new" during these working hours and it felt like a droplet of water in the desert. Unfortunately, it was the only drop. It is impossible for the substantially lower numbers of pups in the Leistungszucht (working dogs) to bring a necessary balance to the masses of pups produced in the Hochzucht (show dogs), let alone to correct the harm done. Therefore, good and healthy German Shepherds Dogs with working abilities will soon be hard to find, which in fact is already the case today. Haben wir in meiner letzten Studie eine tolle Übersicht über die erfolgreichsten (mit der Betonung auf „reichsten“) und aktuelle Deckrüden der letzten Jahren bekommen, wäre es doch schön, mal ihre individuelle Blutlinien zu verfolgen und zurück zu blicken auf ihre gesamte Ahnentafel. Man würde meinen, hier werden wir einen wunderschönen und variierten Streifzug durch „die gesamte, breite Blutbasis der Rasse des Deutschen Schäferhundes“ machen können, eine breite Blutbasis, welche die Zuchtwarte des Vereins immer so gerne als oberste Priorität auf ihrer Liste platziert sehen wollen, nicht zuletzt bei der Siegerhauptzuchtschau, und eine breite Blutbasis die ja förmlich ganz laut nach aussen geschrieen wird in sämtliche Publikationen des SV. Und weil wir es hier mit der „crème de la crème“ der Züchter von Deutschen Schäferhunden zu tun haben, würde man hier doch, wo denn sonst, ihre kynologischen Kenntnisse, ihre Vielfältigkeit und ihre Flexibilität zurückfinden müssen. Ich möchte Ihnen keineswegs zuvor kommen, es wird aber eine riesige Enttäuschung werden. Am Anfang dieser Studie hatte ich gemeint, es würde eine Heidenarbeit werden. So viele Hunde, jeweils mit Vaterlinien und Mutterlinien. Wird das zu bewältigen sein? Schon rasch habe ich erfahren müssen, dass es ein Kinderspiel ist. Eine sehr einfache copy/paste-Geschichte ( = „kopieren und einfügen“). Dass man irgendwann mal, ganz am Ende der Geschichte, wieder bei Horand von Grafrath enden muss, dass habe ich, wie Sie auch, schon gewusst. Dass ich aber bereits nach äusserst wenigen Generationen immer wieder bei den gleichen Hunden landen würde, und sich das weitere Verfolgen der Linien deshalb erübrigt, weil es ja nur eine einzige Linie gibt, welche im übrigem allgemein bekannt ist, das habe ich NICHT gewusst! Die Nachkommen, der am meisten eingesetzten Deckrüden, bestimmen zweifellos nach wie vor die Rasse und ihre Zukunft. Wenn diese Studie eine Sache dokumentiert, dann, dass die Zukunft keineswegs „breit“ angesetzt wird, vielmehr nur von einer fortgeführten Verengung die Rede ist, eine Verengung, die ja begann bei Xaver von Arminius und Palme vom Wildsteiger Land. Wenn man seine Botschaft deutlich rüberbringen will, muss man sie anschaulich darstellen. Ich hoffe, ich werde das schaffen. Die beigefügte Tabelle ist auf jeden Fall an Überzeugungskraft nicht zu überbieten. Es werden 130 ausgelesene Deckrüden verzeichnet, es sind allesamt Rüden, welche in meiner letzten Studie: „Das Deckgeschehen im SV - 2003-2007“ aufgeführt wurden, weil sie in diesem Zeitraum die grösste Anzahl an Sprüngen gemacht haben. Rüden mit weniger als 10 Deckakten wurden entfernt. Es wurden auch einige junge Rüden hinzugefügt, welche sich in den letzten zwei Jahren bereits als erfolgreiche und wichtige Deckrüden für die Zukunft etablieren konnten. Zusammen sind die genannten Rüden verantwortlich für den wichtigsten Pool an Deutschen Schäferhunden, welche nun bei den Ausstellungen die vorderen Platzierungen schaffen werden und in Zukunft, die gleichen Blutlinien (wie schon immer) weiterführen werden. Die Tabelle wurde auf Basis der Daten erstellt, geliefert durch die SV-Decknachrichten, welche die Aktivitäten der führenden Deckrüden in den letzten Jahren eindeutig dokumentieren. Note: Es mögen zwar auf der Siegerschau viele Hunde mit interessanten und abweichenden Ahnentafeln erscheinen und somit eine breite Blutbasis vortäuschen, einen Impakt auf die Zucht haben sie allesamt sicherlich nicht. Sie werden nämlich nicht in der Zucht eingesetzt oder kaum. Wer aber sehr wohl einen Einfluss auf die Rasse hat, sind die Top-Deckrüden, welche zuletzt in meiner Studie vorgestellt wurden. Sie multiplizieren nicht nur die Qualitäten ihrer Vorgänger, sondern festigen auch oder sogar ganz besonders, die Defizite. Es gab schon eine ganze Reihe an tollen Rüden, welche ich vorgestellt hatte. Eine ganze Menge Holz also, die Ahnentafel von so vielen Rüden zu studieren. Komischerweise wurde meine Entdeckungsreise zu den Vorfahren von erschreckender Langeweile und fantasieloser Einheitswurst bestimmt. Aber schauen Sie selbst! Schauen Sie sich nun bitte noch einmal kurz im Überblick die beigelegte Tabelle an. Sie sind bestimmt, genauso wie ich, erstaunt über die Tatsache, dass es eigentlich nur eine einzige bestimmende Blutlinie gibt. Sie dominiert noch heute das ganze Deckgeschehen der Toprüden in der Hochzucht. Die Blutlinie fängt bei den Ahnen von Xaver von Arminius und Palme vom Wildsteiger Land an. Studieren Sie bitte einmal kurz die Ahnentafel diese Pärchens. SO sehen also fast alle heutigen Ahnentafeln in der Hochzucht aus. Alle gleich! Und auch die Hunde sind... konform, zu gross und zu schwer, gleichfarbig, ...mustergültig. Alle sind Kopien von einander. Kommissar Rex, der neue Rin Tin Tin, lässt grüssen! Die meisten entsprechen auch nicht mehr dem festgelegten Rassestandard, aber wenn alle zu gross sind, fällt da sowieso keiner mehr auf. Man braucht also, nach circa 30 Generationen von Deutschen Schäferhunden, keineswegs eine riesige, viele Quadratmeter grosse Tafel an der Wand, um die vielen Stämmen des Baumes zu dokumentieren. Eine Din-A4 Seite genügt, um die Ahnentafel von fast allen Deutschen Schäferhunden der Neuzeit übersichtlich darzustellen. In diesem Zusammenhang erinnere ich mich noch gerne an meine ersten Studien der Blutlinienpläne, welche von der freundlichen Frau Roswitha Buck hergestellt und verkauft wurden. Ich hatte sie auf den Fussboden ausgebreitet, sie füllten die vollständige freie Fläche des Wohnzimmers. Jetzt kann man dem Liebhaber, das „wesentliche“ auf einem einzigen Blatt anbieten. Und obwohl es sehr „übersichtlich“ ist (wie Loriot es zusammenfassen würde), ist es genau das, was wir NICHT wollen. Eine Anhäufung von gleichem Blut und nebst Qualitäten, auch von vielen Defiziten. Auf den Verfasser dieses Berichts braucht ja kein Mensch zu hören, ich habe in der Zucht nichts bewiesen und bringe da keine Erfahrung bei. Aber wenn die Vereinsspitze noch nicht einmal auf ihre besten Vertreter hört, dann haben wir ein massives Problem. Ja, warum hört denn keiner zu? Jedes Jahr aufs neue, wählen die Bundeszuchtwarte die gleichen Linien aus und, Pi mal Daumen, nicht im geringsten basiert auf ihren langjährigen „Freundschaften“, suchen sie sich (wieder) einen Vertreter der selben Blutlinie aus. Die Kynologie UND die Erfahrung, wie diese von den wirklich einzig übrig gebliebenen Gebrauchs- und Herdenhundzüchter vom Kirschental, bleiben auf der Strecke. Leider verhallen auch ihre Schreie im Dunkeln. Höre ich da Joschka Fischer munkeln: “Fröhlich dem Untergang entgegen!”? Auch wenn massenweise Erfahrungen und Kenntnisse von eingefleischten Fachmännern gesammelt wurden und mittels Internet jedem Laien, aber auch den Verantwortlichen des Vereins in schriftlicher Form zur Verfügung stehen, es schlägt sich nicht in Verbesserungsvorschlägen der Vereinsspitze und der respektiven Zuchtwarten nieder. „Die letzten beiden Präsidenten haben unsere Rasse in einen genetischen Engpass geführt. Bei vielen Spitzenhunden ist eine Inzucht auf die gewichtssteigernde, d.h. die Rolf-Familie über viele Generationen mit einer Anhäufung von 10 bis 20 mal und darüber keine Seltenheit. Der neuen Vereinsführung und besonders dem neuen Vereinszuchtwart, fällt die schwere Aufgabe zu, die Rasse vorsichtig aus diesem Engpass herauszulenken, ohne das Kind mit dem Bade auszuschütten. Genotypendatenbank: Der Gentechniker, der diese Datenbank einspeisen soll, kann nur dann positive Arbeit für die Rasse leisten, wenn er in seiner Arbeit von einigen alten, erfahrenen Züchtern begleitet wird. Je weiter ihre Erinnerungen und Erfahrungen in die Vergangenheit zurückreichen, je wertvoller wird ihre Mitarbeit sein. Und nun Herbert Born selber, Juli 2001, in: „Der DSH, Weltweit Gebrauchshund Nr.1, hat dies heute noch Gültigkeit? „Nun stellt sich die Frage, warum die Diskussion um die heutige Gebrauchstüchtigkeit? Wieso wird die Leistungsfähigkeit des Deutschen Schäferhundes plötzlich angezweifelt? Haben Verantwortliche bewusst oder unbewusst Fehler gemacht? „Der Nachfolgepräsident Hermann Martin stellte in den ersten Jahren seiner Amtszeit die gesamte Zucht unserer Rasse auf nunmehr nur noch zwei Säulen und führte mit der Quanto und Canto-Linie die heute noch gültige absolute Hochzucht ein. Dies führt zu einem genetischen Engpass, da sie sich in der Mutterlinie über den L-Wurf Liane/Lido von der Wienerau auch noch sehr ähnlich sind. Eine vermehrte Inzucht dieser Stämme ist die logische Folge und für jedermann nachlesbar, der eine Ahnetafel dieser Linien studiert. „Durch die immer schneller wechselnden Generationen der Hochzuchthunde, die oft schon mit zwei Jahren, durch die DNA-Analyse wissen wir, sogar schon oft unter zwei Jahren in die Zucht gehen, manche sogar ohne gewisse Zuchtvoraussetzungen! Wie ist das möglich? Hochplatziert auf Siegerschau in Jugend oder Junghundklasse reicht oft aus, um als Deckrüde sofort nach Erreichen der 24 Monate?! gefragt zu sein. Dadurch sind natürlich schnellere gewünschte Zuchterfolge in Gebäude und Veränderungen gleich welcher Art zu erzielen. „Durch die Einführung der Hochzuchtlinien hat Dr. Rummel in den 70-iger Jahren die Zucht auf die 4 Rüden Marco vom Cellerland, Mutz von der Pelztierfarm, Canto und Quanto von der Wienerau, blutlich stark eingeengt. Canto von der Wienerau erhielt bei seiner Erstankörung am 19.09.70 in Schwandorf von Körmeister M. Fröscher die KKl.2 mit „Kampftrieb vorhanden“. Auf einen solchen Rüden mit fehlenden Triebqualitäten eine besondere Linie aufzubauen, halte ich schon für eine so bekannte Gebrauchshunderasse und deren Einsatz auch als Diensthunde für sehr gewagt. Die Bernd und Bodo-Linie hatte scheinbar keine Lobby, denn aus dieser Linie gab es auch leistungsstarke, sowie auch gebäudemässig überragende Tiere wie Bredo vom Lichtburghof, Joll von Bemholt und sein Sohn Hardt vom Sprühturm, sowie Seffe vom Busecker Schloß, VA, und Bruder Sirk, Junghundsieger! Bis hier einige wichtige Aussagen, welche im Schäferhundverein leider keine Beachtung gefunden haben. Ich überlasse es gerne meinen Lesern sich ihre Gedanken zu machen. Gehen Sie bitte zu dem oben genannten Link, und lesen sie dort die vollständigen Kommentare dieser Experten. Diese Aussagen haben einiges gemeinsam. Allesamt kommen sie von absoluten Fachmännern auf dem Gebiet der Schäferhundezucht, übrigens mit jahrzehntelanger Erfahrung, und sie zeigen gravierende Problematiken auf. Leider haben sie es auch gemeinsam, dass weder Präsidenten noch Bundeszuchtwarte des SV Wert auf diese von ihnen vorgestellten Fakten legen. Es hat auch nicht das Geringste gebracht. Seit Jahrzehnten wird der SV dirigiert von einigen wenigen Auserwählten. Von einem demokratischen Zuhören kann nicht im geringsten die Rede sein. Die respektiven Gremien haben sich als inkompetent erwiesen, sonst würden zahllose Änderungen, sowie Vorschläge in der Zuchtordnung dokumentiert worden sein. Fehlanzeige! Man hat trotz vieler Warnungen nichts dazu gelernt, die Kritiken nicht angenommen oder studiert, und der Deutsche Schäferhund wurde zur Lachnummer und wie Rittmeister von Stephanitz befürchtete: zum „Nurluxushund“. Jetzt muss mir doch einer der grossen Kynologen (Bundeszuchtwarte) einmal erklären, was so aussergewöhnlich am Q-Wurf von Arminius war (ausser der Tatsache, dass er den Schoss des von Arminius-Rüden Xaver des Herrn Herman Martin - im “Nebenberuf” Präsident des Vereins entsprungen – und in die Zuchtstätte seines Freundes Martin Göbl – Zwinger vom Wildsteiger Land - gefallen ist), dass gleich die gesamte Rasse darauf basiert werden musste! In Verbindung mit Palme vom Wildsteiger Land haben sich angeblich nicht nur die guten Eigenschaften eingeschlichen, sondern ganz besonders auch die HD. Beide Eltern konnten keine perfekten Hüften nachweisen, ... aber das ist eine andere Geschichte. Das kommt später mal an die Reihe. Der Q-Wurf von Arminius mit Sieger Quando brachte den legendären (in Holland gzüchteten) Odin von der Tannenmeise hervor. Durch den Q-Wurf von Arminius/Uran Wildsteigerland (Palme), Odin Tannenmeise (Quando A) und Cello Römerau (Quana A) war die Inzucht wohl sehr eng geworden. Später brachte uns die Palme –Uran –Quando –Odin und Cello-Linie: Ulk von Arlett, Ursus von Batu, und Yasko vom Farbenspiel. Wie breit ist sie denn, diese Basis der Rasse? Ich kann es nicht sehen. Wenn Sie bis heute an eine breite Blutbasis geglaubt haben, dann tut es mir leid, wenn ich Ihre Träume vernichtet habe. Klären Sie mich auf, wenn Sie dennoch glauben, dass es für die Rasse eine gesunde Zukunft geben kann. Ich habe die Hoffnung verloren, weil es an der Spitze des Vereins an kynologischer Kompetenz fehlt und an der persönlichen Kraft und Mumm der Amtsinhaber um gegenzusteuern, Kraft und Mumm welche für ein Amt als Bundeszuchtwart z.B. erforderlich sind. Wenn man sich weiterhin auf einige wenige Blutlinien in der Hochzuchtsparte konzentriert, geht die Gesundheit der gesamten Rasse zugrunde. Verabschiedet von dieser Kulisse haben sich schon einige. Ich hoffe sehr, diese Leute werden sich um die Gesunderhaltung einiger weniger Stämme der Deutschen Schäferhunde bemühen. Dann werden sie, in den Fussspuren des Rittmeisters Max von Stephanitz, würdige Züchter der Deutschen Schäferhunde mit Gebrauchseigenschaften sein. Was für eine Freude war es, ganz am Ende der Liste, nach der einheitlichen Suppe, nach aller Uniformität, doch noch eine Ahnentafel vervollständigen zu dürfen, weit entfernt von alle Hochzucht-Duplikaten. Ein einziger Rüden konnte in der Liste der viel gefragten Rüden mit einem völlig anderen Stammbaum aufgenommen werden: Ajax vom Röhnsaler Bach. Hier gab es kein „copy/paste“. Die Namen der Vorfahren waren (obwohl selbstverständlich wohl bekannt) wie „neu“ während dieser Arbeitsstunden und fühlten sich an wie ein Tröpfchen Wasser in der Wüste. Leider blieb es dabei. Die Masse der Hochzucht gibt der im Umfang wesentlich geringeren Leistungszucht keine Möglichkeit um gegenzusteuern, geschweige denn auszugleichen und der Rasse ein notwendiges Gleichgewicht zu bieten. Gute, gesunde und gebrauchstüchtige Deutsche Schäferhunde werden demzufolge alsbald die Ausnahmen sein. Zumindest, wenn sie es heute nicht schon sind.